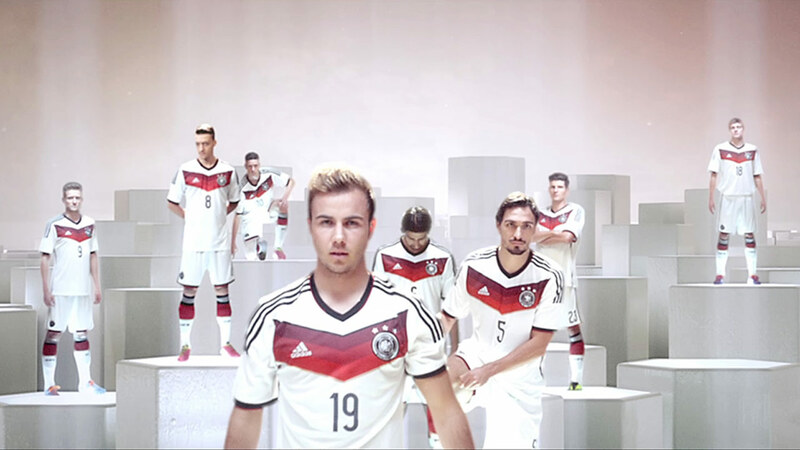 This latest ad for Mercedes features the German national football team, who the car brand are sponsoring in this year's FIFA World Cup. Set to Rudimental's hit track 'Not Giving In', we see a combination of car and football related shots, which move through the Mercedes logo, finishing up on a packed pitch full of supporters. A selection of elements was carefully crafted in CG by The Mill's 3D team including a CG Car, stadium, shirts, balls and environments. The montage of live action shots and CG elements were then weaved together into one fluid motion in Flame to form what looks like a single camera movement that then moves through the Mercedes logo. Lead 3D artist Rob Holmes comments, "This film presented us with the unique challenge of stringing together full CG, with live action anamorphic and non-anamorphic RED footage seamlessly. In the hands of our talented artists we used Flame, Nuke, 3D Equalizer, Maya and Arnold to create and augment 16 individual shots which were expertly conceived by AlexandLiane and our concept team."